The people of Seriyiri a suburb of the Wa West District in the Upper West Region embarked on a demonstration over the weekend to stop further disposal of refuse at the Seriyiri dumping site. This action was taken after serveral calls on the Municipal Assembly to come for a new damping site has failed. The Chief of Seriyiri Naa Yakubu Kayuori said “We have been deceived for long and we will no longer take it. We earlier on wanted to allocate a new site to the Municipal Assembly but now the decision by my people is that we do not want anymore refuse here”. According to him the land was given out because, they were made to believe the refuse were meant for the manufacturing of compost manure. The youth were promised jobs at the proposed factory and since the people are predominantly farmers, they think recycling the refuse into manure will boost their farming activities but for 20 years now, the only reward they have received is rubbish upon rubbish. Salia Eliasu, a teacher who live close to the site, said he competes with flies for his bowl of food. “The dumping site is posing health threat, causing school drop out. Half of my class pupils are now scavengers” he said. 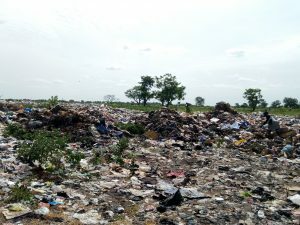 The Wa Municipal Chief Executive Alhaji Issahaku Tahiru Momin said dumping site started since the 1998. “We all are aware that as we develop changes must come, but we are lucky that we still have abundance of land available to us. Seriyiri still have a vast land area so as other parts of the municipality. We must come together to tackle the situation”. He further assured the people that “we will relocate the dumping site whether the chief and elders of seriyiri give us a new parcel of land or not. I however plead with you to still give us sometime to look for a new dumping site”. June 24, 2018 in Business, Local News.